CSK captain MS Dhoni scripted the win by his knock of 58 runs in the chase of tricky 150 runs at Jaipur. With this win Dhoni becomes first captain in the IPL history to win 100 matches. Let’s read out the complete details of RR vs CSK 25th match IPL 2019 here. Where : Sawai Mansingh Stadium, Jaipur. Toss : Chennai Super Kings won the toss and opt to bowl. RR Inns : Jos Buttler – 23(10), Ben Stokes – 28(26), Deepak Chahar – 4-33-2, Ravindra Jadeja – 4-20-2. 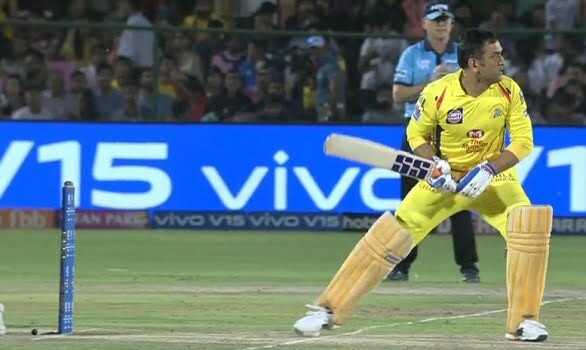 CSK Inns : Ambati Rayudu – 57(47), MS Dhoni – 58(43), Jofra Archer – 4-1-19-1, Ben Stokes – 3-39-2. Click here to read ipl 2019 match records.